Undiscovered resorts are often the best, don’t you think? I often find that the less commercial a place is, the more I enjoy it. Italy has such a resort, known as Puglia. 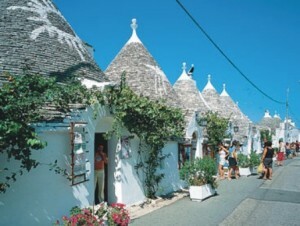 I like resorts where I can really sample the culture, food and general way of life, and in Puglia, I can do just that. Here you will find an authentic experience, with regular cultural festivals and events running all summer – the perfect time to visit. Saying that, the temperature is good all year around, so whenever you choose to visit, you’ll be guaranteed good weather. Flights are regular throughout summer, and travelling can be made cheaper still by pre-booking great value airport extras, such as airport hotels, meaning you leave the UK chilled-out, ready to enjoy your time away. Check out Normandy Hotel Glasgow Airport for great rates, or alternatively, Moat House Hotel at Gatwick for flights from the capital. Architecture and history buffs will love Puglia, with many examples of former rule evident even today, and limestone formations to explore. Nearby Lecce is a must visit in my opinion, with its beautiful churches and streets – the ideal place to sit and people watch with a refreshing drink. Alternatively, popular Brindisi is a great place to visit, and I’d recommend it for its stunning cathedral and architecture. I love days on the beach, and Puglia doesn’t disappoint, with beautiful sandy stretches and crystal clear waters to dip my feet into. Nearby Salento has wonderful beaches, with a good transport network getting you from A to B. Water-sports are available, but it’s more about sitting on the beach, soaking up the sun and enjoying the relaxation. That is my kind of day – bliss. Nightlife in Puglia isn’t raucous and loud, in fact most entertainment will be in hotels and local bars and restaurants, however I would recommend you try some local cuisine whilst you’re here – after all, who doesn’t love Italian food?! Sink your teeth into some fragrant pasta and a glass of local wine – delicious! An evening winding down, with fantastic food, wine, and company is what it’s all about here. Relaxation holidays are really priceless, yet the cost of a visit to Puglia can be cut even further, as well as your stress levels, by pre-booking an airport hotel. Check out Hilton Hotel Manchester and see what great deals can be found. Undiscovered, unspoilt and relaxing. What more could you want?